Somerset have avoided punishment for a "below average" Taunton pitch against Lancashire - but have been warned that points deductions will be made for future breaches of regulations. England and Wales Cricket Board officials agreed with the rating of the surface for the County Championship match on 4-5 September. However, they did not find evidence it was deliberately under prepared. The game ended in a tie, with 25 of the 40 wickets falling to spinners. Somerset's England Test left-armer Jack Leach returned career-best match figures of 12-102, while Lancashire's Keshav Maharaj took 7-37 in the final innings as the hosts were bowled out for only 77. A Cricket Discipline Commission statement said "Somerset's practice of preparing pitches to assist their spinners" had been noted, but added they "must take care that it is in the right degree" and were "treading a very fine line". The statement concluded: "Somerset's pitch preparation will continue to be monitored very closely. The club should expect any proven breach of ECB's pitch regulations in future to result in a points deduction." Reacting to the ruling, Somerset chief executive Andrew Cornish said the club accepted the findings of the CDC and felt it was "critical to note that there is no evidence to suggest that there was any intention to alter the state of the pitch in any way". 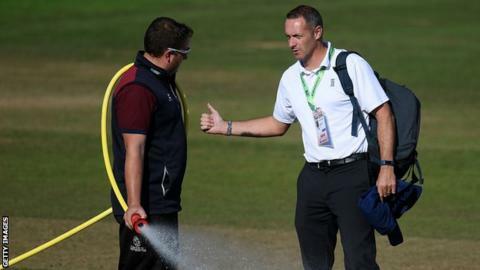 He also supported head groundsman Simon Lee and his colleagues, who Cornish said "do an outstanding job" in preparing pitches at Taunton "to the highest possible standard and will continue to do so". The tie with Lancashire was followed by defeat at Hampshire in this week's round of fixtures, which all but ended Somerset's hopes of catching Division One leaders Surrey in the Championship title race.